BIS Am/Can Ch. 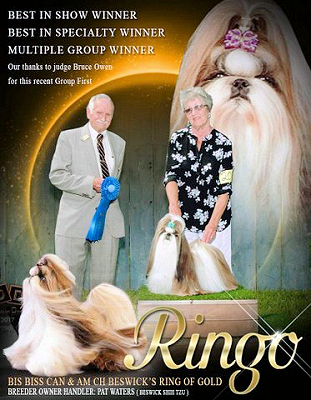 Beswicks Ring of Gold - "Ringo"
Ringo is a breeder owner/ handlers dream. He accomplished from puppyhood Best puppy in show, Best Bred By in show Best Owner Handler in show and his AKC Championship . He is a very impressive dog with Beautiful coat, tail and bite.His main strength is his carriage which he is passing down to his kids.